IBANEZ MC-924 DS MUSICIAN BASS 1982 Dark Stain MIJ sting clayton porcaro fujigen. Condition is Used. Ibanez mc924 1982 A great bass, all original except for the upgraded hipshot tuners and wood truss cover. Plays like a breeze at very low action, truss works fine, circuit is all healthy, no issues. Battery compartment cover is replaced, works fine though and has been done tidily. A bit weathered cosmetically. Superb sound and playability! Condition c rank, healthy neck and circuit, but with some noticeable cosmetic flaws. Comes with generic gig case, ships globally for prices indicated, to most destinations. Up for sale is a sweet 1978 Ibanez MC-300 Musician in its original natural finish. The guitar has also been refrettedwith larger fret-wire. The fret job is not the prettiest we've seen, but the guitar plays very well up and down the neck. Nice 1978 Ibanez MC200 Musician series. With Ibanez Patent Pending Velve -tune locking tuners. We will not alter values or list as gift. Ibanez Musician junior left handed guitar. Condition is Used. Shipped with USPS Parcel Select Ground. MC30th Limited Edition Musician Bass. MC30th Specs. Special MC30TH Inlay. It's hard to believe that thirty years has gone by since the debut of the Musician Bass series. While the Musician wasn't the first bass to feature active electronics it was the first with that technology that most working musicians could afford. Matching pair of Ibanez Super 88 pickups. These are original from 1978. They’re in great condition and have not been tested. This is a terrific opportunity to get your Musician back to original. Shipping is calculated and no returns will be accepted. Thanks and good luck! 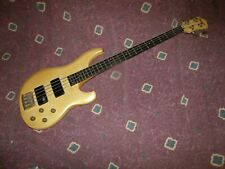 Ibanez Bass guitar Roadster 1981 RARE! Professional musician's instrument! This is a most fantastic sounding and playing bass. Great neck from the zenith of Ibanez' golden era. Session player/pro musician. Fantastic ebony neck. A very good sounding bass indeed. Ibanez Musician Series MC400DS 1979 Electric Guitar. Ibanez 's famous machine, Musician Series MC 400 DS arrived. Made in 1979. Serial: A 795758. It is a rare one with a high-class feeling and versatile functionality unique to the series high-end model. 1978 Ibanez MC300 BS Brown Stain. A rosewood fretboard on a rigid Maple & Walnut lamination through neck, a half & half nut of a cow bone and brass found in Ibanez of this age, a Super 88 Tri Sound pickup × 2 on an ash body (wing material), Tri Sound switch which switches "picking up series humbucker · coil tap (using neck side coil together · phase)", it is possible to make a variety of sounds with 2 humbucker simple specifications. Made in Japan, great condition, plays and sounds amazing, neck straight, frets good, no issues. Color : Natural. All Electronics/Hardware function as they should. Ready to play when you get. Condition: Used. Serial Number . 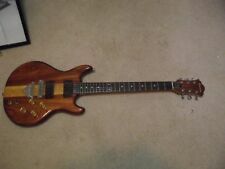 Super cool and rare electric from the early 80's. All original and in good condition. On the side of fretboard there was playwear where it was also painted. Gold hardware. Rosewood fingerboard. 3 way tone selector. This is your chance to get your hands on a good classic dealer price list for the price you want. This price list is in good /- overall condition as you can see in pics- creased down the center. Don't pass this by! .it will fit like its supposed to and will keep your original and the value in check! 1978 Ibanez Gold Strap Button Set. As found on Artist, Musician, and Studio Series. Note: only 1 original felt washer included! Original wide-knurl signature Ibanez mounting ring still present. 1978 Ibanez 3-Way Switch w/Tip. Specs: 31 pages, 9" x 4". Made in Japan. Item will be S&H via. This is a rare piece in good condition. Has been in storage since 2000. Height of the Ibanez Artist model years! Back is Mahogany. It is clean all around aside form a couple mild scratches on top side from being hung on wall. YOU SEE THE FRONT AND THE BACK IS BLANK. NICE IBANZE WHITE ON BALCK LOGO T. NEAR MINT CONDITION. ADULT SIZE 2X. CHEAPER ON THE WEST COAST EVEN!